Jay Z and a gaggle of his very famous music friends ushered in the new age of Tidal at a press event, revealing an "artist owned and operated" streamer aimed at turning the tide on the industry. Jay Z bought Tidal in January, and while we were waiting for a relaunch we were never quite sure what it would mean. That became clearer today as Alicia Keys (of course), Kanye West, Beyoncé, Jack White, Madonna, Daft Punk, Usher and a handful of other big names positioned Tidal as a music streamer for artists and users alike. Here's the main premise: instead of being paid out by advertiser dollars, which many artists claim is next to nothing, Tidal offers artists two times the standard streaming royalty rate. This stands in direct contrast to Spotify, a streaming service unpopular with certain musicians and pop stars because of how little it pays them. 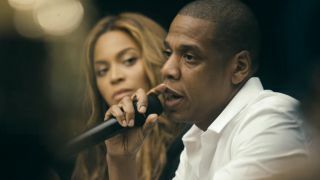 Specifics weren't discussed during the Tidal press event so it's still hush-hush how much Tidal artists are paid and exactly what kind of ownership we're talking here, but Jay Z is reportedly offering an equity stake and a large sum to artists who sign on the dotted line. The new Tidal may be what artists have wanted out of a music streaming service, but what about users? Tidal's biggest selling point is that it streams with hi-fidelity sound quality, a lossless experience at a high $19.99/£19.99 price point. However, earlier today Tidal split its service in two. Now, users can sign up for the "Premium" Tidal at a cost of $9.99 or "Tidal HiFi" for $19.99. The lower price is more accessible but it also only streams in standard quality audio. The higher subscription, meanwhile, streams in "lossless high fidelity." Apparently only streams on the higher tier will pay out the higher artist royalty rate. The idea of paying artists more may seem fair, but it may not be sustainable. Spotify has argued that introducing listeners to artists' music for free leads to them eventually paying for their music. It has 15 million paying subscribers while Tidal to date has 17,000. But if artists like Taylor Swift continue to pull their songs from Spotify and Tidal gains traction, the tide could indeed turn, taking users along with it. Read our full Tidal review!